A Belfast councillor has been given a six-month suspension after she was found to have breached the local government code of conduct. 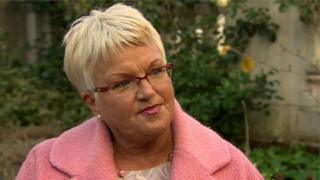 Ruth Patterson made allegations of links between a north Belfast football club and a senior republican. She made the comments during a meeting of Belfast City Council in July 2017. She linked Crumlin Star FC to a "man named in parliament as a senior member of the Provisional IRA". The sanction follows a hearing last week at which the Local Government Commissioner for Standards, Marie Anderson, found that Ms Patterson had breached the Local Government Code of Conduct. The commissioner concluded Ms Patterson had breached three aspects of the code. In its determination, the commissioner's office said her remarks were a "deliberate act which caused offence to the players and members" of Crumlin Star FC. "She also concluded that in making the comments she had not shown respect and consideration for others, and had not acted fairly, objectively or in the public interest." In deciding the sanction on Monday, the commissioner said she noted a number of mitigating factors in Ms Patterson's favour, "including her long service on Belfast City Council with no previous history of misconduct". Ms Patterson also co-operated with the Deputy Commissioner's investigation into the complaint made against her. However, the Commissioner also accepted "that there were aggravating factors in this case". She said Ms Patterson's actions were "deliberate and pre-meditated". The suspension is to begin on Monday 11 March and will continue until the end of Ms Patterson's term of office. Ms Patterson was formerly a DUP councillor but was expelled from the party in 2015 and has since sat as an independent. She was speaking during a debate about whether Crumlin Star, based in Ardoyne and which does not have a home pitch, should use playing fields at Strangford Avenue in south Belfast. The unionist councillor said she was against the move, citing the club's alleged links with a senior republican. She was cut short by then Lord Mayor Nuala McAllister while other councillors intervened in protest at her comments. A complaint about the remarks to the Local Government Commissioner for Standards, Marie Anderson, was lodged by SDLP councillor Tim Attwood. Mr Attwood said Crumlin Star had been subjected to "reckless and dangerous" allegations and were "vindicated" by the commissioner's findings.